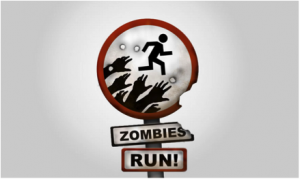 Connected Health » Uncategorized » Zombies, Run! Now that January’s over it becomes socially acceptable to chuck all new years resolutions out the window and focus on putting wrong all you did right for the month! This is especially the case when it comes to fitness regimes. There are those though who will resist the urge to throw it all away and battle on into the year, although they might not always possess the right dosage of motivation. Well now Zombies, Run! is here to help. A new mobile app, which gives users the perception that they are actually involved in a zombie apocalypse, helping give runners that extra motive of fun to keep them wanted to hit the tarmac. The game has an array of missions, which you have to complete in order to move forward and the only way to defeat them is by running. A unique added feature becomes integrated with your music as well as you run, commentary letting you know zombies are on your tail as well as moans and groans of the brain eaters gets you moving even quicker than ever. Collectables are up for grabs on your mission, which can be used in the game to help you move forward and defeat the zombies. Missions will last approximately 25 minutes consisting of five sections making the app usable for all levels of runners. So for those of you that need the extra kick to put on those running shoes, just indulge in Zombies, Run! and have a bit of fun with it.